Top engagement proposal ideas- How To Pop The Question? How To Pop The (Engagement) Question? A proposal is always exciting, it takes your senses, thoughts and feelings above and beyond your everyday life. Once you are done with our Recommended Stores and set up on a ring, it is time to move on and plan your proposal. We took some ideas, and sure you find some that fit your thoughts. Got more ideas? Add them as a comment and let us post for everyone! 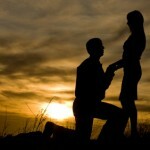 Sunset proposal is exciting, because you get real natural scenery, usually on one of the land’s beaches. A sunset proposal should take place on land or on a boat, at a crowded place or all alone, nevertheless a classic! A dinner proposal is a common but fancy proposal that allow your senses to come alive even before the special dessert. Dinner proposals should be done at one of the finest restaurants at your vacation or home area. Proposing at one of the parks can be related to both public and natural proposals ideas. Though not “A walk in the park” to the proposer, but a park is definitely a recommended point of a highly stimulation for the eyes, mind and body. At a lecture, class, hallway or lab, an engagement at a college territory is unique and will always remain in your head. The college is mostly remembered as a “Time of your life”, so why not use that memory and even make it better? With a little help from a friend or a barista, ask the coffee guy to add a little note to her cup. On cup or cover, this should definitely make a caffeine kick to her morning! When finished with dirty thoughts, try hooking your engagement ring to your dog, and send her a ball or a stick. For sure the excitement of an afternoon with the pets will increase the moment she will notice the extra box on the collar. Why not turn an engagement proposal to a guessing game? Take a hint or two, send her on a pursuit after the answers, either at home or at various places, and wait at the final point- with the final question! Tell her that you are going on a business trip and set a Skype call for later that evening. As she is getting ready for your call, saddle at a neighbor’s apartment, or a nearby café. At the right moment, you will dispatch your question, and as she is shocked, you will knock on her door. Don’t forget to record the video! As we are on the few last years that people actually seat in front of a TV and watch the news, it is a nice trick to use the News intro, followed by a 30 seconds pre recorded reporter claiming for “Breaking News”, about the day that is going to change your life, and then popping up the screen with one question. Pay attention for her to be focused on the report! Driving daily to work or school? Listening to the same radio show? Try asking the radio man to make a special request on show! Off course you should be prepared to arrive at her destination with an engagement ring, or- just store it in the gloves compartment. Step by step is a description of a puzzle game, which pieces are apart and should be collected at different places, or a chain of posts, commercial signs or txt messages that hint of the next letter/ word or question mark. Usually used as a test cheating method at various educational institutes, we find it unique to have your words written in black on the bottle of a dark drink, and the moment she drinks more and more, she can notice the writings. Is she reading a book? Bookmark her! Sunday morning and you guys usually sit in the sun with your coffee, paper or book. Why not replace her old bookmark with an original one? You can write down “will you”, or put a ring. Theater? Movies? Take her out for a cultural evening, and ask the stage manager or the cinema boy to plant a pre ordered sign of your proposal phrase, that will show as curtain falls down at the end! Get in touch with a painting artist, Photoshop a picture of the both of you as a sketch or a cartooned pic, than add some words as “will you marry me”, and ask a friend to play as an artist and paint you guys on one of the warm evenings on the sea sidewalk. One sign, 2 poles, 1 ring and off-course- a skier girlfriend. Ask her on a ski trip- week long or a quickie, set a sign and dispatches it to the resort head office or one of the skiing schools and ask for their assistance. Make sure you put the ring at the correct jacket. Wait to see the look on her face, the moment she realizes that this annoying flying quad copter is actually carrying a massage for her. Quad copters are available for rent including a pilot and an edited video of the flight, as they are able to carry signs and rings! Attached to absolutely nothing, prepare yourself to jump from a building edge, a boat a cliff or window, but make sure that you know where you’re going- a balcony, life boat, ladder or so. Than stand on the edge and do your thing. Better take an expert, and choose a spot that would not get you sued. Pick your wall of a deserted building, or a construction site, than create the artistic painting including your proposal and feelings, as you happen to walk by later that evening, bring to her attention the graffiti art! Get a group of professional dancers and have them meet you just by case on the street, as you arrive they will start in a special dance show, that surprisingly includes- you. By the end of the dance, you will have your future to be fiancé on a high excitement, and will have a moment of proposal. Have a designed report, and post it as a news report on one of the Newspapers that happen to find their ways into your house that morning, start looking at the headlines, and draw her attention to one of the reports right before yours. That way she will have her eyes reading out of curiosity for the next post. Not common today but still in use, grab her Smartphone or laptop and secretly change her wallpaper or screen saver, planting some very nice sentences about your relationship, a nice picture and off- course, a proposal. Having troubles opening that bottle? Let me help you. Get an empty bottle of champagne, and make a note of a proposal. Then, attach the note to the cork, so it will open while pulling the cork up. As you both are starting your romantic evening at home or under the stars, ask her to help opening the bottle and get ready with the ring. As you are about to reach your vacation, ask the flight attendant to use the speaker, or acoustically get on your knee and do your thing on the isle. A private plane might also be an option, as you fly over your hometown or Grand Canyon. Put some letters on the table that looks like ordered in somewhat direction, than once your girl sees something and gets closer, open a vent or a nearby window that would make it all scramble. Once you start putting back together all the pieces, she will start to read and there you go, take out the ring.